The Villa d'Este, originally Villa del Garovo, is a Renaissance patrician residence in Cernobbio on the shores of Lake Como, northern Italy. Both the villa and the 25-acre (100,000 m2) park which surrounds it have undergone significant changes since their sixteenth-century origins as a summer residence for the Cardinal of Como. Nevertheless, visiting the garden in 1903 for Century Magazine, Edith Wharton found this to be ‘the only old garden on Como which keeps more than a fragment of its original architecture’, and noted that ‘though Queen Caroline anglicised part of the grounds, the main lines of the Renaissance garden still exist’. Since 1873 the complex has been a luxury hotel. Gerardo Landriani, Bishop of Como (1437–1445), founded a female convent here at the mouth of the Garovo torrent in 1442. A century later Cardinal Tolomeo Gallio demolished the nunnery and commissioned Pellegrino Tibaldi to design a residence for his own use. The Villa del Garovo, together with its luxuriant gardens, was constructed during the years 1565–70 and during the cardinal’s lifetime it became a resort of politicians, intellectuals and ecclesiastics. On Gallio’s death the villa passed to his family who, over the years, allowed it to sink into a state of some decay. From 1749 to 1769 it was a Jesuit centre for spiritual exercises, after which it was acquired first by Count Mario Odescalchi and then in 1778 by a Count Marliani. In 1784 it passed to the Milanese Calderari family who undertook a major restoration project and created a new park all’Italiana with an impressive nymphaeum and a temple displaying a seventeenth-century statue of Hercules hurling Lichas into the sea. After the death of Marquis Calderari his wife Vittoria Peluso, a former ballerina at La Scala and known as la Pelusina, married a Napoleonic general, Count Domenico Pino and a mock fortress was erected in the park in his honour. In 1815 it became the residence of Caroline of Brunswick, estranged wife of future King George IV. "Its garden seems almost suspended in the air", she wrote in her diary, "and forms a scene of complete enchantment." She gave it the name Nuova Villa d'Este and had the park landscaped in the English style. It was converted into a deluxe hotel for the nobility and the high bourgeoisie in 1873, and kept the name Villa d'Este to take advantage of the apparent link with the famous Villa d'Este in Tivoli, near Rome. A gala dinner held at the Villa d’Este in 1948 was the scene for the celebrated murder of the wealthy silk manufacturer Carlo Sacchi, shot dead by his lover Countess Pia Bellentani with her husband’s Fegyverzyar automatic pistol. Today, with room rates averaging €1000 ($1122) a night and top suites averaging €3500 ($3926) per night, the villa is a luxury hotel for wealthy people and a high level congress center. In June 2009, Forbes reckoned it the best hotel in the world while in 2008 it was listed as the 15th best hotel in Europe and 69th best hotel in the world by Travel + Leisure magazine. Every April the hotel holds a Concours d'Elegance for vintage and concept cars, the Concorso d'Eleganza Villa d'Este which was first presented in 1928; in September it hosts the annual Ambrosetti Forum, an international workshop attended by prominent figures from the fields of politics, finance and business which has taken place there since 1975. ^ Edith Wharton, Italian Villas and their Gardens (New York: The Century Co., 1905), p. 208. ^ Vivian Russell, Edith Wharton’s Italian Gardens (London: Frances Lincoln, 1997), pp. 15–17. ^ ‘Born a fisher-lad of Cernobbio’, according to Edith Wharton (p. 208); Vivian Russell (p. 46) however, identifies him as the son of a wealthy silk merchant and notes that the wealth created by this industry financed the construction of many of the lakeside villas. ^ Touring club italiano, Lombardia: escluso Milano (Touring Editore, 1999), p. 298. ^ Vivian Russell, p. 46. ^ a b Leoni Marco and others, ‘Villa d'Este – complesso’, Lombardia Beni Culturali, Regione Lombardia and Università degli Studi di Pavia, 2006. ^ Edgcumbe Staley, Lords and Ladies of the Italian Lakes (London: John Long, 1912), p. 118. ^ Robins, Jane (2006). Rebel Queen: How the Trial of Caroline Brought England to the Brink of Revolution. Simon & Schuster. ISBN 978-0-7434-7826-7. p.5. ^ Macadam, Alta (1997). Blue Guide Northern Italy. A & C Black. ISBN 0-7136-4294-7. p. 111. ^ ‘The Gardens oF Villa d’Este’ Archived 2015-06-17 at the Wayback Machine, www.villadeste.com, 2006. ^ ‘The Bellentani case’, MUCRI. 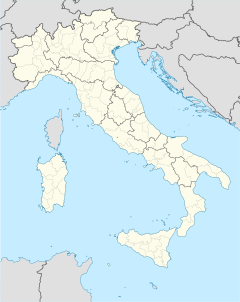 The Italian Ministry of Justice – Department of Prison Administration. ^ Italy: Form Letter, Time, 17 March 1952. ^ "Villa d'Este - Cernobbio - Lake Como". Trip Advisor. Retrieved 2009-05-01. ^ Koyen, Jeff (June 9, 2009). "Is this the world's best hotel?". Forbes. Archived from the original on June 19, 2009. Retrieved June 26, 2009. ^ "2008 World's Best Awards". Travel and Leisure. Retrieved 2009-04-05. ^ ‘Villa d’Este’s Who’s Who’, p. 5. ^ ‘Ambrosetti Forum 2007: September 7-9’, Financial Times. Desmond, Steven (2016). Gardens of the Italian Lakes (Hardback). London: Frances Lincoln. ISBN 978-0-7112-3630-1. Edgcumbe Staley, Lords and Ladies of the Italian Lakes (London: John Long, 1912), pp. 116–129. This page was last edited on 11 January 2019, at 11:58 (UTC).